Linguists refer to this highly endangered south-central British Columbian language as Thompson or Nlaka'pamux. It is classified as an Interior Salish language; there are believed to be fewer than 600 speakers of Thompson / Nlaka'pamux today. Salishan languages were once spoken throughout what are now British Columbia, Washington state, Oregon, Idaho and Montana. Today the Thompson people live in the Fraser Canyon area of southern British Columbia; in former times their range extended in to Washington state. These translations of services from the 1662 Book of Common Prayer were prepared by English SPG missionary John Booth Good (1833-1916) between 1878 and 1880. Each pamphlet was printed by the mission press established by the SPCK in Victoria, British Columbia. 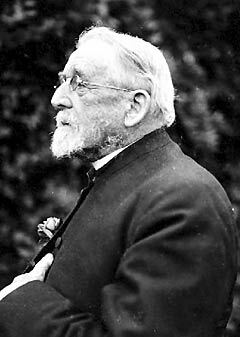 Born in England and educated at St. Augustine’s College, Canterbury, Good began his North American ministry in Nova Scotia. After this (with the exception of two years of furlough in England in 1874-1875) Good served parishes in British Columbia at Nanaimo, Yale, Lytton and Lillooet for nearly four decades from 1861-1899. Good’s Vocabulary and Outlines of Grammar of the Nitlakapamuk or Thompson Tongue was published in 1880. Griffiths does not list any translations into this language in his Bibliography of the Book of Common Prayer, but they are discussed briefly by William Muss-Arnolt in Chapter LXX of The Book of Common Prayer among the Nations of the World. 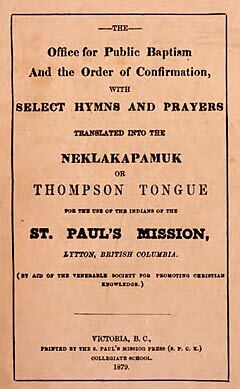 The Morning and Evening Prayer, and the Litany, with Prayers and Thanksgivings Translated into the Neklakapamuk tongue, for the Use of the Indians of the St. Paul's Mission, Lytton, British Columbia. The Office for Public Baptism and the Order of Confirmation, with Select Hymns and Prayers. Available online through GoogleBooks. Offices for the Solemnization of Matrimony, the Visitation of the Sick, and the Burial of the Dead, this work. (Also available as PDF graphics from the Internet Archive). BY J. B. GOOD, S.P.G. MISSIONARY, YALE-LYTTON.